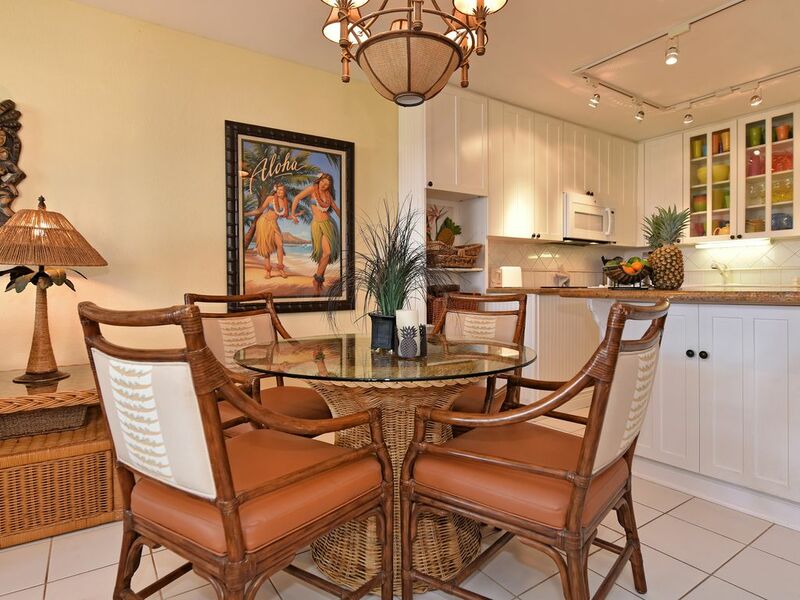 We have remodeled our condo at Kamaole Sands to the highest standard . It is a home away from home with every convenience for our guests. A gourmet kitchen fully equipped for a gourmet chef. Granite counters with all new appliances and cabinets. Best of the best. A new king bed along with all the comforts of home. Tiki's, Hawaiian quilt, plantation shutters and artwork complete our decor. All the amenities of home, including a new full size washer and dryer. Beach umbrella, cooler and beach chairs are just a few of the items we provide. Bring your I Phone & I pod - we have the docking station with Sony speakers. If you don't have one that is OK because we have music CD's. Sometimes it is the little things that really make it an enjoyable stay and we try to do this for our guests. You will enjoy our LARGE lanai overlooking the beautiful gardens (CENTRAL COURTYARD) with a view over the gardens and out to the ocean. Free local phone calls. Free daily newspaper and weekly Mai Tai party at the pool with live music and complimentary Mai Tais. A gym room with weights & machines to keep up the daily rountine. Our condo is an end unit which makes it very quiet and also private. The unit is on the third floor and gets wonderful sea breezes, plus ceiling fans and air conditioning. FREE HIGH SPEED INTERNET (wireless) provided to all our guests for your computer. Maui has everything you could possibly want in a vacation. A 5 minute walk from the time you leave our condo and your feet are in the ocean! Maui's best beaches are at your door step along with snorkeling, diving and all water activities. Kamaole Sands is a 15 acre Resort centrally located with restaurants, grocery stores, and shopping... all within walking distance. Beautiful tennis courts (4) and large pool plus hot tubs. Wailea is only minutes away with golf courses, beaches, etc. We enjoy our time in Maui and haven't found a spot anyplace in the world we like better. Come see for yourself. We enjoy sharing our little bit of paradise with our guests. Kamaole Sands is a complete full service resort on the sunny south side of Maui. I remember the very first time we drove in and we both said 'WOW' this is it!! The tropical gardens surrounding the beautiful buildings, fountains and flowers are so impressive. We have traveled the world and always happy to come home to the best beaches in the world at our doorstep. The views over the 15 acres of gardens and out to the ocean are spectacular. Being an end unit gives us privacy and it also very quiet. No road noise or people walking past. The condo is very bright and also a home away from home. We spend time here each year and make sure everything is in working order and comfortable for our guests. No matter how long we are here, it is always hard to leave! Beautiful place with large lanai, beautiful views of the garden and ocean. Did not have to use AC once, the breeze was wonderful! The kitchen fully ready to cook (would consider bringing my spices next time though) hallway closet packed with items; beach chairs, cooler. No need to bring! Washer and dryer saved my life with 2 little ones! Thank you Judy! Fantastic. Nothing beats Maui and Judy's spot is one of the best we've ever stayed at Kam Sands! It was great! Nice employees, beautiful landscaping, great location! We had a wonderful time! The owner was so sweet & her communication response time was near immediately. She made great recommendations and we were very happy with the condo. Thankyou so much! We will definitely recommend it to others! We enjoyed our 2 week stay at Judy's condo in the Kamaole Sands complex. Easy walk across the street to the beach and walking distance to shops and restaurants. We never turned on the air conditioner as the trade winds blew through the condo with front door and lanai door open. We slept comfortably. I would definitely recommend the condo. The owner responded to our calls in a timely manner. My husband and I stayed in this one bedroom condo for a week in early December. The pictures of the unit were accurate. The best features of this one bedroom are the renovated kitchen with it's granite centre island, large end unit balcony and two full baths. The decor is tropical and the kitchen is well stocked. Wifi is strong. The air conditioner was old and very noisy but luckily we only needed it one night. The balcony overlooks the property pool and gardens and it's a short walk to the pool or the beach. The bedroom overlooked the staircase and parking lot. TV was good in living room, but the one in the bedroom was extremely old and small. The building is in a great location; close to restaurants, bars and shopping. The owner was fantastic to work with and responded very quickly. Overall the buildings are older and the bathrooms need updating. The TV is being replaced next month! We try out best to make it a home away from home and respect our guests comments. The bathrooms have been remodeled ! We loved the condo and it is the best one so far at Kamaole Sands. We have been to the resort many times over the years and this time was the best experience. Privacy and quiet is big with us and this fit our needs, along with the views. The large lanai was our home away from home. Cooking, relaxing and reading was our routine and a perfect spot to relax and recover from our busy mainland lives. I would recommend it to family and friends. A $60 fee is due upon check in paid directly to the resort. This is in addition to above costs.This includes a check in and resort cost which provides daily newspaper, weekly Mai tai party, wi fi, free parking etc etc Credit card payment option will add 3% to total cost. Foreign 5% It is NOT included in quoted rates Cancellations: No refunds within 90 days of arrival unless I am able to rent the unit. The difference between actual funds received and amount you paid will be refunded, less a $300 service fee. $200 cancellation fee outside 90 days prior to arrival. Remaining funds will be returned. Cancellation on or after arrival - all funds forfeited. The final contract will be sent after booking. It explains in more detail all information. This is the controlling contract with terms.